We’re excited to be heading in to 2018 with our amazing team. 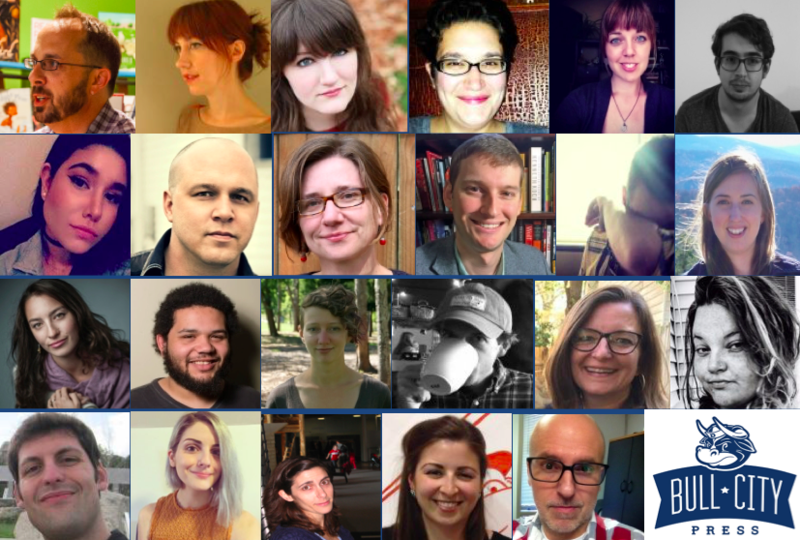 Check out some of the newest faces in the newest places at Bull City Press! Welcome to the team, Gabrielle Bates! Julia Ridley Smith joins Matt Poindexter and together they will share editor responsibilities at Inch. Julia’s short stories have appeared in American Literary Review, Arts and Letters, Carolina Quarterly, Chelsea, failbetter.com, Greensboro Review, and storySouth, among other places. Her book and art reviews have been published in the Raleigh News and Observer, Art Papers, Southern Cultures, and elsewhere. She has enjoyed residencies at the Millay Colony and the Virginia Center for the Creative Arts, and was a Tennessee Williams Scholar in fiction at the Sewanee Writers’ Conference. A graduate of UNC-Chapel Hill and Sarah Lawrence College, she lives in Greensboro, North Carolina, with her family. She joined Bull City Press in September, 2015. Shout-Out to Carmen Maria Machado on her breakout title Her Body and Other Parties (Graywolf). Carmen joined our team in 2013 and now will step back from day-to-day INCH responsibilities to pursue all the great things that are happening associated with her writing and her stunning bestseller. Congratulations, Carmen! Ashley Nissler lives in North Carolina with her husband and two daughters. A graduate of the MFA Program for Writers at Warren Wilson College, Ashley’s work has appeared in Cricket, Ladybug, and Tar River Poetry as well as online at Strange Horizons and Literary Mama. Ashley has graciously opened up her home (and sizable culinary skills) to host our House Party Reading Series. Hosted in Hillsborough and Durham, NC, the House Party Reading Series is a chance for writers and readers to hear some of the most exciting voices in contemporary letters.